As a real estate agent working in a competitive market, you need to make sure that you can do everything that you can to bring in clients and make them happy. You need to make sure your office is constantly presentable, but this can be difficult when you have lots of signage, presentation files, documents, reusable home décor, etc. All of these things take up space — space that you don’t really have in a real estate office. So, how do you combat all of this? With self-storage, of course. 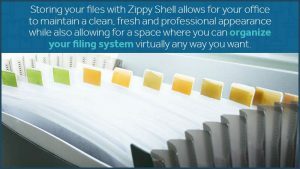 Here are three ways having a storage services from a facility like Zippy Shell can actually do you a favor. 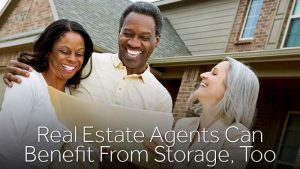 More than likely, your real estate office has a ton of boxes with important files in them. If not, then you are probably keeping those files in a filing cabinet. Either way, neither of these are particularly attractive in an office (even though filing cabinets do fit in better), but you need to make sure these files are safe and secure. Aside from your office, where can these files be kept safe, secure, organized and accessible? Self-storage. This allows for your office to maintain a clean, fresh and professional appearance while also allowing for a space where you can organize your filing system virtually any way you want. If you don’t mind the filing cabinets in your office, then you may not need a storage unit for your files. However, you can only have so many filing cabinets and they aren’t large enough to hold everything. Think about all of your signs, brochures, banners and other marketing goodies that you need to make your business work. Signage and banners can take up a lot of room and won’t fit in your filing cabinets, but you don’t want them spread around the office for all of your prospective clients to see when they walk in. So store these items in the same or a separate self-storage unit, where they will remain clean, undamaged and ready-to-use. In this competitive industry, you need to do whatever you can to get an edge over other real estate agents in the area. If you can offer your clients a safe and secure location where they can put their “clutter” from their home during an open house, it could make a world of difference if they’re on the fence about whether to use you or another realtor. When you are willing to go the extra mile, your clients will appreciate it. At the same time, you can use the storage unit to hold some of your reusable home decor and staging supplies, such as throw pillows, flower arrangements, candles, artwork and garden decor. If you’re ready to take advantage of the flexibility, convenience and value-enhancing features of a self-storage unit, contact Zippy Shell today. Currently, you can get content protection for half off and $40 off any storage rental that is reserved this month. All you need to do is mention this blog post! In addition, if you’re paying more than $140 per month for a unit at another facility, come in and we’ll beat the price by 20 percent and help you move for no charge!